After last-ditch attempt to keep him in Shas failed, Eli Yishai announced Monday he is forming a new party to be called Yachad. 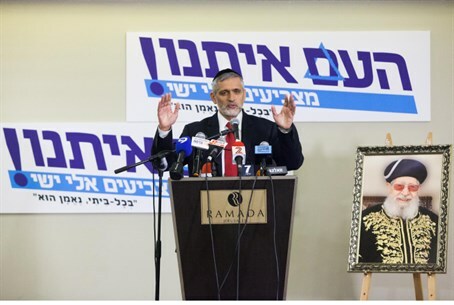 Former Shas Chairman Eli Yishai held a press conference Monday night in Jerusalem in which he announced the establishment of a new party to run in upcoming elections for the 20th Knesset. "It is not an easy day for me," Yishai said at the press conference. "Shas has filled many important roles in Israeli governments. I struggled with the decision but ultimately the Israeli citizens tipped the scales for me." "I have no doubt I am creating a new party with clean hands, honesty, and trust," Yishai added. For days, reports have circulated of Yishai's plans to abandon Shas after 30 years and form his own party, perhaps in a deal with Tekuma head Uri Ariel. A last ditch attempt by current Shas Chairman Aryeh Deri and other Shas rabbis Monday morning to prevent the split failed, and Yishai stated his definite intentions to leave and head a new party. When announcing the press conference earlier, Yishai was sitting next to MK Yoni Chetboun who resigned Sunday from Jewish Home, with which he has served as a Knesset member for the past two years. At the press conference itself, Chetboun officially announced he is joining Yishai's new party. Chetboun, who is expected to be a significant factor in the new party, said that the party represents a "unity between religious, hareidi, and traditional" Jewry. "Concern for the disadvantaged and strengthening Jewish heritage is our party's agenda. It is the message the people are crying out for," Chetboun said, adding that he is "more than happy to join forces with Eli Yishai." The name of the new party will be "Yachad" (Together) signifying that the party's initial name "Maran" [another name for Rav Ovadiah Yosef] was rejected. However, Yishai stressed that his party will do everything in its power to maintain the legacy of Yosef. Several hours ago, Yishai held a convention for campaign supporters and volunteers in which he promised "many surprises" and stated that he had received offers to join other parties. "Friends, I warn you, whoever, God forbid attacks the Council [of Torah Sages of Shas] will be fired immediately. I want completely clean elections and proper behavior," Yishai stressed. "I had many offers from a lot of places and from all sorts of parties - that does not matter," Yishai was heard saying in a recording revealed by "Kol Harama" Radio. "I am here to enlarge the party and expand the party. Friends, do not worry, you will see many surprises with God's help. Many people from different political parties will join us. Patience, and in the name of God, we shall succeed." Earlier Yishai's associates told Arutz Sheva that there is an understanding between Yishai and the Shas party that they will not attack each other during campaigning. If Deri does indeed attack Yishai, then Yachad will pull what they are calling a "doomsday weapon." "The minute they will try to turn Eli Yishai into Haim Amsalem or Amnon Yitzhak, he will reveal recordings that will make Aryeh Deri regret the moment he didn't come to terms with Yishai," they warned. Shas, as expected, attacked Yishai's decision to leave. "Shas regrets Eli Yishai's decision to leave Shas and abandon his career and the legacy of Rabbi Ovadiah Yosef. We regret that personal desires and foreign motives brought Yishai to this state." Shas remains a unified and cohesive party under the leadership of Chairman Aryeh Deri, and we will continue to consolidate the Israeli public under the the social and Jewish flags of Shas and Maran," the party said in a statement.